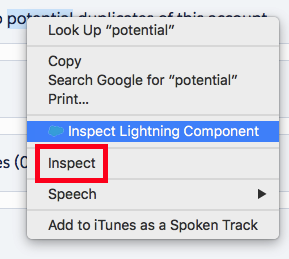 The Salesforce Lightning Inspector is a Google Chrome DevTools extension that enables you to navigate the component tree, inspect component attributes, and profile component performance. The extension also helps you to understand the sequence of event firing and handling. 2. Install it by clicking "Add to Chrome". 3. Right-click Lightning Component and select Inspect.